Upward mobility: Job success for Workforce graduates! Debra Sue Lorenzen, St. Nicks Alliance Director of Youth and Education; Joanna Persad, Waste Management's Government and Public Affairs Manager for NYC; Laura Ennis, St. Nicks Alliance BK Story Voyager Coordinator; Roberto Serrano, St. Nicks Alliance Site Director at PS 147; Evelyn Vazquez, Deputy Director of Elementary School Services; and the students of PS 147. PS 147 students read about trees, storms, and protecting the environment. Recently Waste Management donated $2000 toward the purchase of books on the environment for the BK Story Voyager. This donation follows Waste Management’s ongoing support for literacy as they gave $1,500 to BK Story Voyager’s Fall Touch-A-Truck event, plus a very generous donation of $26,000 in 2015. On January 11th, Joanne Persad, Waste Management’s Government and Public Affairs Manager for NYC, came by during the BK Story Voyager’s visit to PS 147 the School for Environmental Engineering. It was a perfect time for the students to read about nature. “Waste Management is proud of the work St. Nicks Alliance does in the community thorough the BK Story Voyager. We strongly believe that literacy is the key to opening the world to young minds,” said Joanne Persad. "St. Nicks Alliance would like to thank Waste Management for their generous gift to the BK Story Voyager. 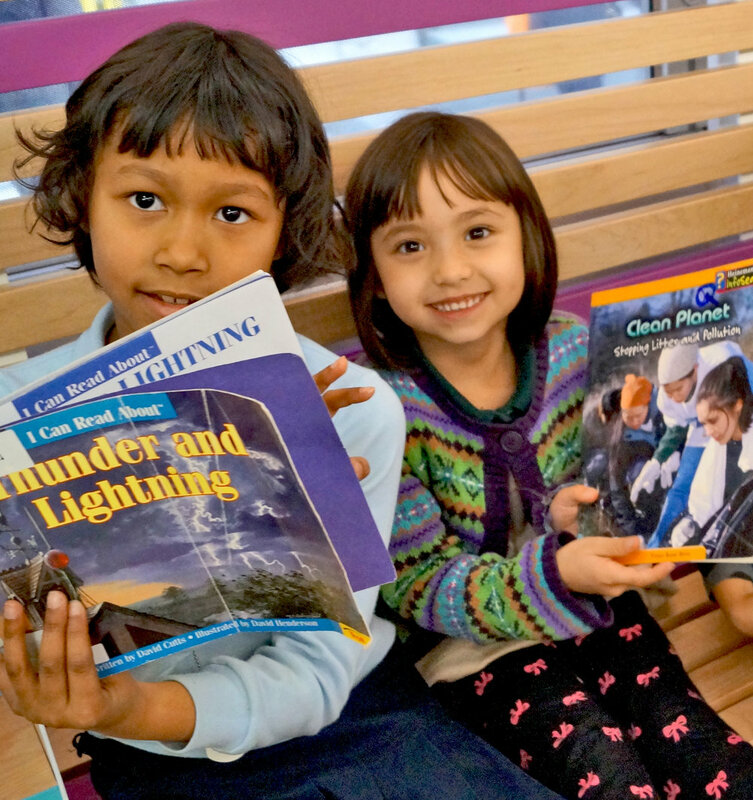 With their funding, upper elementary students will research and recommend books about the environment to add to our collection," said Laura Ennis, St. Nicks Alliance’s BK Story Voyager Coordinator. A ribbon cutting celebrated the rejuvenation of 590 Dekalb Avenue, a building of affordable senior housing units that first opened for residents in 1984. In 2010, the board of Consumer Action Program of Bedford-Stuyvesant (CABS) Senior HDFC looked to rehabilitate the property to ensure permanent affordable housing for generations. In addition to St. Nicks Alliance’s Property Management staff, Rockabill Advisors LLC, Nomad Architecture, FG-PH Corp., Hirschen Singer & Epstein LLP, JR Landscaping & Neoscape Gardens, and MHR Management all played roles on the development team. Financing was provided by New York State Housing Finance Agency, Richman Housing Resources, and JP Morgan Chase. When William Pernisek started at CABS in 1973 the area consisted of abandoned buildings and vacant lots. “This building and the nursing home were the first investments in this particular area. We were a business that did minority business loans. In being a socially relevant agency, we noticed there was a great need for services for the elderly. By providing those services you provide jobs, cash flow, and make a difference,” said Pernisek. CABS Senior Houses project started in 1982 when CABS Corp. sought to expand housing opportunities for elderly residents after achieving success with CABS Nursing Home. CABS Senior HDFC was formed to construct the 111-unit building is adjacent to the nursing home. 50 years ago CABS started as a group of local residents dedicated to providing housing and senior services to improve the social and health conditions of their residents. This past year, St Nicks Alliance Workforce Development placed 16 local residents (15 graduates from its Skilled Build training) as workers at the Domino Sugar factory site. Developer Two Trees Management is transforming the iconic industrial property into a state-of-the-art, 400,000-square-foot, mixed-use waterfront development. In early 2016, Workforce Development launched Skilled Build, a 5 ½ week rigorous construction training course. Two cohorts, totaling 29 enrollees, have graduated and received their OSHA 10, scaffolding, flagger and 80-hour NCCER recognized credentials, along with developing workplace success skills. Two Trees and St Nicks Alliance came together in 2014 to devise a way to develop a trained local workforce that could service the developer’s needs for the 10-year redevelopment project, including construction, building services, and permanent commercial jobs. Two Trees subsequently committed to filling 40 local jobs with Skilled Build graduates. Funding for Skilled Build made possible by the St. Nicks Alliance board of directors, the NYS Department of Labor Regional Economic Development Council, and DYCD. 2016 has been a springboard year for the graduates of St. Nicks Alliance Workforce Division’s Skills Training. The year brought a total of ten training classes in the areas of environmental remediation, construction, and commercial driving. So far nine training classes across three areas have graduated 98 students. The tenth class, for Commercial Driver Licenses (CDL), will graduate after they complete their scheduled road test, which would bring the number of total graduates to 107 (if all nine CDL students pass the test). Julian Pagan, a new graduate of St. Nicks Alliance Workforce Development Skilled Build Construction Training, said he found out about the training from a flyer posted in the Cooper Park housing complex, where he lives. His steadfast dedication to learning throughout the five-and-a-half week course served him well toward earning his certificate. He and his 14 fellow graduates received training in 10-hour OSHA, Fire Guard/Torch Operator F-60 certifications, plus certifications in Flagger, Scaffolding, and concepts of basic construction coursework of the National Center for Construction Education and Research (NCCER). Mr. Pagan started working less than one month after completing his construction training. He presently works as a construction laborer with Bayport Construction Corporation. Roger Leak is another a recent graduate of St. Nicks Alliance Workforce Development training, but his chosen course was Environmental Remediation Technician training. He was soon hired by WRS Environmental Services and November 28th will mark his one month anniversary on the job. Olawale Ojelade graduated the ERT training earlier this year. 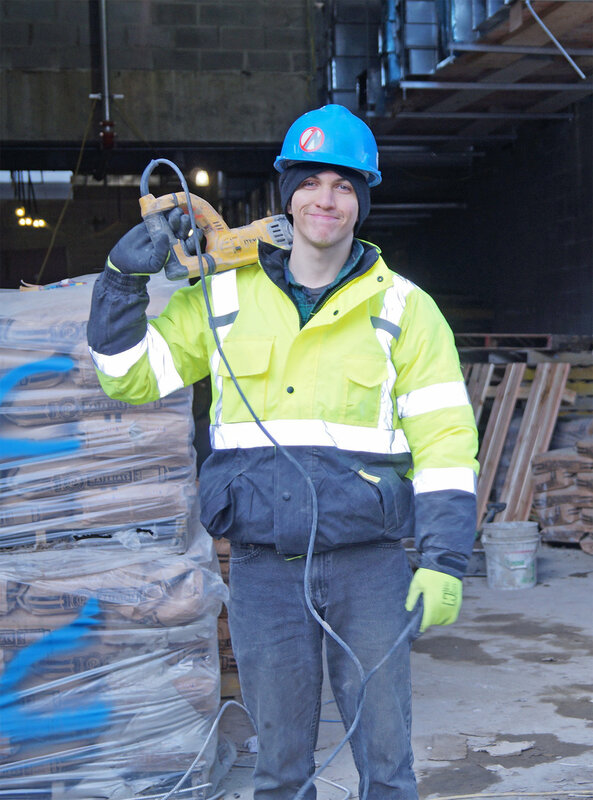 King C Iron Inc. put him on the job in mid April as a laborer helper. Today he is a supervisor at the company, which means he has been promoted within the seven months he’s been on the job. Another success story came not via the trainings but via the dedication of individuals at St. Nicks Alliance Workforce Development. Daniel Grant came in to convey his thanks to Bob Din, St. Nicks Alliance Workforce Development Skills Training Account Manager and Program Manager Beatrice Brown. Bob and Beatrice worked together to get him placed into a job, and he was hired by ACE at Essex Crossing site. Mr. Grant told them he is making $20 an hour at the site, in addition to having a potential boost in the near future based on his performance. This is a major turnaround from the first time he walked into Workforce feeling a lack of confidence that he'd be matched to a job or that this would all happen at no cost to him! A donation of $200 or more toward the School Settlement Association’s new community center will get you satisfaction in supporting your community and a satisfying meal of delights from longtime locals. 2016 kicked off with a Kickstarter community cookbook campaign. The completed cookbook with a $20 price tag is filled with recipes that run the gamut from old world classics like Grandma Ponitz’s Baked Stewed Southern Chicken with Biscuits via Stephanie Dobosz to modern vegan like Kale Berry Salad with Coconut Date Dressing via Brooklyn Borough President Eric Adams. The cookbook was compiled and edited by Taylor Erkkinen, who came up with the idea. She is the owner of the Brooklyn Kitchen. To celebrate the cookbook and raise more money for the community center, those who donate $200 to the new School Settlement will be invited to have dinner at the Brooklyn Kitchen on March 16th at 6pm. The Joint Ownership Entity (JOE NYC) and St. Nicks Alliance Corporation announced the acquisition of two affordable real estate portfolios comprised of 248 apartments from MHR Management, Inc. Through Workforce Development, Dian received job training that helped her earn a fair, living wage to support her children. Help us keep those classes in session in 2017. What happens when you hear things that go bump in the night, and these bumps happen to be someone taking a sledge hammer to your water main, knocking down a support beam, or clipping power lines to your apartment building?